America's version of All Saints' Day started out spooky and malevolent, but has been transformed by jaunty American commercialism into a fun kids' festival of sweet consumption...especially in Salem, Massachusetts. All Saints Day (November 1) is a principal feast of the Roman Catholic and Anglican churches, probably following the medieval custom of commemorating "saints known and unknown" on this day, sometimes known as Allhallows or Hallowmass. In countries with Celtic influence the vigil on the night before All Saints, the evening of October 31st, incorporated old customs of the Celtic and British Isles, including lighting bonfires, fortune-telling, masquerading and mummery (masked performers in a folk play or mime). These customs probably had more to do with the onset of winter (the "dead season"), traditionally commemorated on November 1st in pagan societies, than with the celebration of Christian saints. In America today the saints have no part to play on October 31st. 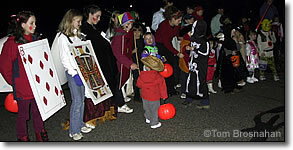 Hallowe'en is a masquerade festival when children dress in costume and go door to door asking for sweet treats. Traditional costumes echo the theme of death and monstrosity: witches, ghosts, goblins, monsters, but in fact any fantasy costume is acceptable, from fairies and spacemen to fruits, vegetables, playing cards and roadkill. "Trick or Treat," the door-to-door custom, used to be a jocular, minor shake-down routine: "give me a treat or I'll play a trick on you." Although vandalism and pranks (occasionally vicious) are still in evidence, the "trick" part of the holiday has little part anymore, at least among the throngs of small children who fill the streets on Hallowe'en evening, going from house to decorated house asking for treats. The symbol of welcome for trick-or-treaters is having the house's porch light on, and/or a lighted jack-o-lantern and perhaps other Hallowe'en-theme decorations: ghosts, witches, black cats and harvest symbols. Adults may attend Hallowe'en-themed parties, often in costume. The unfortunate martyred souls persecuted by superstitious colonial officials and religious bigots in Salem during the Salem witch trials of 1692 must turn in their graves at the sight of thoughtless romantics dizzy with ditzy visions who turn Salem into an absurd carnival of bizarre pseudo-mystical claptrap every October 31st. 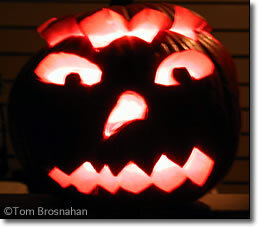 Above, a jack-o-lantern carved from a ripe autumn pumpkin, symbol of Hallowe'en. Below, kids dressed for trick-or-treat.